^ 2.0 2.1 2.2 2.3 2.4 Calcaterra, NE; Barrow, JC. 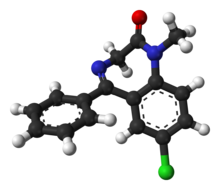 Classics in chemical neuroscience: diazepam (valium).. ACS chemical neuroscience. 16 April 2014, 5 (4): 253–60. PMID 24552479. ^ Diazepam. PubChem. National Institute of Health: National Library of Medicine. 2006 [2006-03-11]. ^ Ogle, guest editors, Harry Dym, Orrett E. Oral surgery for the general dentist. Philadelphia: Saunders. 2012: 8. ISBN 9781455710324. ^ 6.0 6.1 6.2 Riss J, Cloyd J, Gates J, Collins S. Benzodiazepines in epilepsy: pharmacology and pharmacokinetics. Acta Neurologica Scandinavica. August 2008, 118 (2): 69–86. PMID 18384456. doi:10.1111/j.1600-0404.2008.01004.x. ^ WHO Model List of Essential Medicines (PDF). World Health Organization. March 2005 [2006-03-12]. "Medication of the Month" at Albany Medical Center. [2014-07-04]. （原始内容存档于2006-06-28）.